8" Plush Bear, Bailey and Friends Collection; This Edmund was released in the Spring of 1996 and retired in 1997. 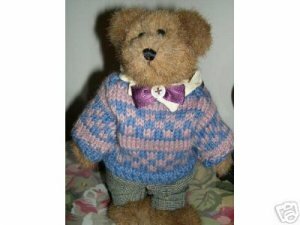 He is 8" tall and comes dressed in a pair of black and white tweed-look trousers and..
8" Plush Bear, Bailey and Friends Collection; This Edmund was released in the Spring of 1996 and retired in 1997. He is 8" tall and comes dressed in a pair of black and white tweed-look trousers and a pretty mauve and blue sweater with a white collar and a burgundy bow attached with a pearl button.